Gary Barns, the highly-successful head basketball coach at Goodrich High School, has apparently received a 15-month suspension from the school district, effectively ending his career at the school. I’m told the suspension is as a result of what the district perceives as a failure to monitor his staff as well as for an incident during which the veteran coach used an inappropriate word in front of his team at halftime. This is such a sad ending to a great career for Coach Barns, who continues to struggle with the declining health of his son, the former head coach of the JV team at Goodrich. Coach Barns and his family deserved better, and I think a lot of people will agree. The Michigan Regional Sports Network (MRSN) will begin its second season covering all Mott Bears basketball games with Saturday’s night home opener versus Grand Rapids CC. Bill Schnorenberg will once again handle all the play by play. Before every Saturday home game MRSN will broadcast The Steve Schmidt Coaches Show with Schnorenberg alongside Mott’s hall of fame coach to recap the previous game and preview the Saturday game. Mott Community College is once again the no. 1 ranked team in the preseason NJCAA national poll. A few other Michigan teams also cracked the top 20, including Oakland Community College led by sophomore guard Aaron Hayes. Mott will take on no. 19-ranked Grand Rapids at home on November 3rd to open the 2012-13 season. The game tips at 7 p.m.
FLINT, Michigan — At a scrimmage Tuesday night versus Mid-Michigan Community College, Mott fans were introduced to a player many had never seen before. Of course they actually had seen Chavis Mattison, one of the few returning players from last season’s national title squad, before … but not this Chavis Mattison. The 6-5 forward played sparingly as a freshman, but has played his way into contention for a starting position for head coach Steve Schmidt. Mattison, as one fan pointed out, looks like an undersized Jalen Rose out there. He is a tremendous ballhandler with court vision and touch. He only got to play in the final session (he had a class) but, as soon as he hit the floor, he started turning heads. Mott assistant coach Yusuf Harris said Mattison has been impressive all preseason. Harris said his abrupt emergence as an impact player reminds him of former Mott and Oklahoma State standout Daniel Lawson. All told, the scrimmage (Mott won all three sessions) didn’t tell us a whole lot about the Bears that we didn’t already know. Mott has a ton of talent, but it’s going take some time to get everyone in the fold. They have a lot of work to do on the defensive end. Mid-Michigan, to their credit, was very competitive early on and have a couple really solid players (especially the lead guard). Mott’s first game is at 7 p.m. at home November 3rd versus Grand Rapids. The Mott Community College men’s and women’s basketball scrimmages versus Mid-Michigan CC have been moved up a day due to a gym conflict. The women will play at 5:30 p.m. and the men at 7:30 p.m. on Tuesday, October 23. 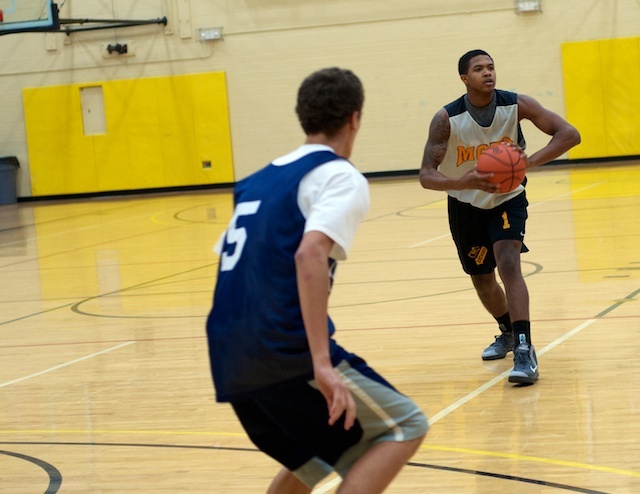 The final men’s team scrimmage will be the following Sunday at 3 p.m. versus Adrian College. Lake Fenton High School has hired 21-year-old Jacob Erway, former assistant coach at Swartz Creek High School, as its new head varsity basketball coach. Former Lake Fenton (now Flint Powers) coach Jeremy Trent brought him over to Lake Fenton this summer to coach the junior varsity squad for the Blue Devils. The hire actually says a lot about the Lake Fenton program. It sends the message that the school is willing to think creatively about the basketball program. Every great coach was once a young, inexperienced, upstart. When the status quo is mediocre, there comes a time to shake things up. It’s that time at Lake Fenton. Erway played for Eric Senter, now an assistant at Fenton, at Swartz Creek, where he graduated in 2009. At 21, he is among the youngest varsity coaches in Michigan. He spent two years as a JV assistant and another year as a varsity assistant. Flint is the only place Mott Community College wins in more than Danville, Illinois. Mott returned to the city in east central Illinois that annually hosts the national tournament on Sunday, where the team beat three very tough opponents. The Bears beat Kankakee Community College in the first scrimmage, Illinois Central in the second and Lakeland (Illinois) in the third. The Bears have one more jamboree on the preseason schedule next weekend in Kankakee (Illinois), just an hour south of Chicago. The team will also scrimmage Mid-Michigan CC and Albion College before the season opener on November 3rd at home against Grand Rapids. Another one of the top teams at the jamboree was Owens (Ohio), coached by former University of Toledo and Mott assistant Dave Clark. The team is led by Justin Edmonds, former standout guard from Albion High School. Mott will play a home-away series with Owens this season. The defending national champions from Mott Community College will be competing in a JUCO Jamboree in Danville, Illinois, on Sunday, the site of their national championship victory just last March. Mott will take on Illinois Central, Lakeland CC and Kankakee CC, three very strong programs.